Jacey Bedford writes fantasy and science fiction, she's been published on both sides of the Atlantic. 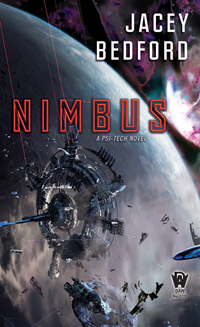 Her first five books are published by DAW: Empire of Dust, Crossways, and Nimbus, Psi-Tech novels. 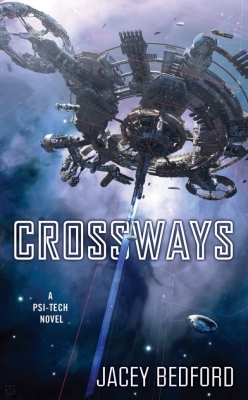 They are science fiction/space opera. 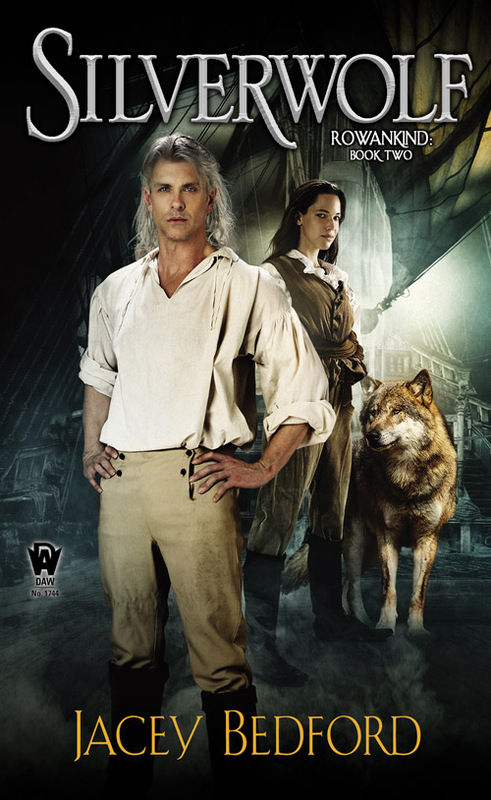 Plus Winterwood, Silverwolf, and Rowankind (The Rowankind Trilogy) - historical fantasy set in 1800 with a cross-dressing female privateer captain, a jealous ghost and a wolf shapechanger. Her writing blog, Tales from the Typeface is on Wordpress. You can follow her writing history from the offer of her debut three book deal with DAW as it happens, plus pick up writing advice and the writing-relevant minutiae of a writer's life. Her personal; blog is on DreamwidthWhat does she blog about? Writing, books, movies, local history, family history, reminiscences, music, things that interest her on a local or global scale. What doesn't she blog about? She doesn't use her blog as therapy. She's on Twitter @jaceybedford also has a Facebook presence and she blogs what she reads on Goodreads (see panel below). A firm advocate of critique groups Jacey was a member of the (now defunct) Recog email crit group for eight years and thanks all her co-critiquers for their excellent input. Now, in addition to attending Milford annually, she takes part in Northwrite SF, a quarterly face-to-face critique group for speculative fiction writers within striking distance of the north of England. Jacey maintains the Northwrite website and you'll find her links for writers there. Apply the seat of your pants to a chair, your fingers to the keyboard and write. When you've finished, polish it. When it's as good as you can possibly make it, format it correctly and submit it. Then apply the seat of your pants to your chair again... etc. Rinse and repeat. There is no other way. If you don't write it and send it out, you'll never get published. Excellent Publisher's Weekly review of Rowankind. "Gripping final Rowankind installment... a strong and satisfying wrap-up of the series"
There's a good review of Rowankind at Arched Doorway. I've done an interview for Civilian Reader. Here's my blog post on Sharon Stogner's I Smell Sheep blog. BOOK DAY! ROWANKIND is published today. Yay! I have an interview up on the Jean Book Nerd blog. An interview with me re Rowankind is now up at File 770. Thanks to Mike Glyer for hosting and to Carl Slaughter for the interview itself. Good questions, Carl. 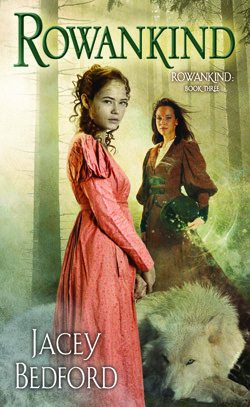 A complete rundown of the Rowankind trilogy ia now up at Fille 770. This one is about Rowankind. The next will be about writing in general. My author copies of Rowankind arrived today! Whoo-hoo! Publication date is now 27th November 2018. 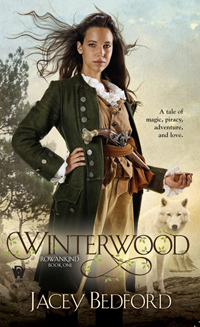 New Blog Post: First chapter of Winterwood. Read it here. Rowankind publication date has been brought forward to 27th November. New blog post: My Week at Milford. I love it when people send me 'shelfies' if they see copies of my books in the wild. 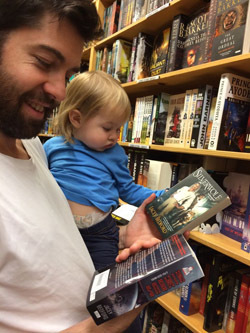 My daughter & family are on holiday in the Pacific North West and sent me this from Powells World of Books in Portland OR. Whoo-hoo! I'm one of the core authors in Zombies Need Brains new kickstarter anthology 'Portals.' Here's a link to the kickstarter for this and two more anthos. It goes live today. New blog post on Character self-determination. Nice review of Silverwolf in The Nameless Zine. Jacey's blog: The Reading Conundrum. Here's my blog post at Authors Electric on The Geography of Words. Comedy panel at Eastercon with me, Jaine Fenn and Juliet McKenna discussing 'Men in Science Fiction and Fantasy' with the delightful Adrian Tchaikovsky as our token male.